"Pistolet" redirects here. For the Belgian bread roll, see Pistolet (bread). For other uses, see Pistol (disambiguation). A pistol is a type of handgun. The pistol originates in the 16th century, when early handguns were produced in Europe. The English word was introduced in ca. 1570 from the Middle French pistolet (ca. 1550). The most common types of pistol today are the single shot and semi-automatic. Sometimes in usage, the term "pistol" refers to a handgun having one chamber integral with the barrel, making pistols distinct from the other main type of handgun, the revolver, which has a revolving cylinder containing multiple chambers. Most handgun experts and dictionaries[who?] make a technical distinction that views pistols as a subset of handguns; others use the terms interchangeably. UK/Commonwealth usage does not always make this distinction, particularly when the terms are used by the military. For example, the official designation of the Webley Mk VI revolver was "Pistol, Revolver, Webley, No. 1 Mk VI". In contrast to Merriam-Webster the Oxford English Dictionary (a descriptive dictionary) describes 'pistol' as a small firearm to be used in one hand and the usage of "revolver" as being a type of handgun and gives its original form as "revolving pistol"
The pistol originates in the 16th century, when early handguns were produced in Europe. The English word was introduced in ca. 1570 from the Middle French pistolet (ca. 1550). The etymology of the French word pistolet is disputed. It may be from a Czech word for early hand cannons, píšťala ("whistle" or "pipe"), or alternatively from Italian pistolese, after Pistoia, a city renowned for Renaissance-era gunsmithing, where hand-held guns (designed to be fired from horseback) were first produced in the 1540s. 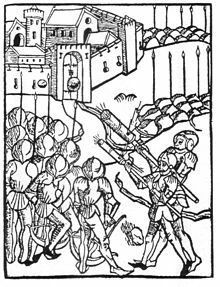 The first suggestion derives the word from Czech píšťala, a type of hand-cannon used in the Hussite Wars during the 1420s. The Czech word was adopted in German as pitschale, pitschole, petsole, and variants. The second suggestion is less likely; the use of the word as a designation of a gun is not documented before 1605 in Italy, long after it was used in French and German. The Czech word is well documented since the Hussite wars in 1420s. Single shot handguns were mainly seen during the era of flintlock and musket weaponry where the pistol was loaded with a lead ball and fired by a flint striker, and then later a percussion cap. However, as technology improved, so did the single shot pistol. New operating mechanisms were created, and due to this, they are still made today. They are the oldest type of pistol, and are often used to hunt wild game. Multi-barreled pistols, such as the Pepperbox, were common during the same time as single shot pistols. As designers looked for ways to increase fire rates, multiple barrels were added to all guns including pistols. One example of a multi-barreled pistol is the Duck's foot pistol, which generally had either four or eight barrels, although some 20th-century models had three barrels. Around 1850, pistols such as the Jarre harmonica gun were produced that had a sliding magazine. The sliding magazine contained pinfire cartridges or speedloaders. The magazine needed to be moved manually in many designs, hence distinguishing them from semi-automatic pistols. Colt Model 1873 Single-Action "New Model Army Metallic Cartridge Revolving Pistol"
With the development of the revolver in the 19th century, gunsmiths had finally achieved the goal of a practical capability for delivering multiple loads to one handgun barrel in quick succession. Revolvers feed ammunition via the rotation of a cartridge-filled cylinder, in which each cartridge is contained in its own ignition chamber, and is sequentially brought into alignment with the weapon's barrel by an indexing mechanism linked to the weapon's trigger (double-action) or its hammer (single-action). These nominally cylindrical chambers, usually numbering between five and eight depending on the size of the revolver and the size of the cartridge being fired, are bored through the cylinder so that their axes are parallel to the cylinder's axis of rotation; thus, as the cylinder rotates, the chambers revolve about the cylinder's axis. The semi-automatic pistol was the next step in the development of the pistol. By avoiding multiple chambers—which need to be individually reloaded—semi-automatic pistols delivered faster rates of fire and required only a few seconds to reload (depending on the skill of the shooter). In blowback-type semi-automatics, the recoil force is used to push the slide back and eject the shell (if any) so that the magazine spring can push another round up; then as the slide returns, it chambers the round. 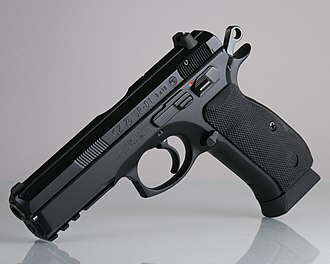 An example of a modern blow back action semi-automatic pistol is the Walther PPK. Blowback pistols are some of the more simply designed handguns. 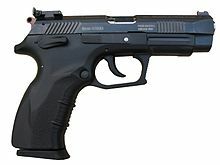 Many semi-automatic pistols today operate using short-recoil. This design is often coupled with the Browning type tilting barrel. Wikimedia Commons has media related to Pistols. ^ "Pistol – Definition". Free Merriam-Webster Dictionary. Retrieved 19 January 2015. ^ "British Dictionary definitions for pistol". Dictionary.com. Retrieved 19 January 2015. ^ a b "Revolver – Definition". Free Merriam-Webster Dictionary. Retrieved 19 January 2015. ^ a b "Revolver – Define Revolver". Dictionary.com. Retrieved 19 January 2015. ^ Skennerton, Ian D., Small Arms Identification Series No. 9: .455 Pistol, Revolver No. 1 Mk VI, p. 10, Arms & Militaria Press, 1997. ^ "Home : Oxford English Dictionary". Oed.com. Retrieved 23 December 2017. ^ a b "Home : Oxford English Dictionary". Oed.com. Retrieved 23 December 2017. ^ "revolver: definition of revolver". Oxford Dictionaries. Retrieved 19 January 2015. ^ The War Office (UK): Textbook of Small Arms (1929), page 86. H.M. Stationery Office (UK), 1929. ^ Karel Titz (1922). Ohlasy husitského válečnictví v Evropě. Nase-rec.ujc.cas.cz. ^ "Naše řeč – Ohlasy husitského válečnictví v Evropě". Nase-rec.ujc.cas.cz. Retrieved 23 December 2017. ^ Newton, Mike (15 April 2012). Writing Westerns: How to Craft Novels that Evoke the Spirit of the West. F+W Media, Inc.
^ Shideler, Dan (24 September 2009). "Jeepers Creepers, Where'd You Get That Pieper?". Gundigest.com. Retrieved 19 January 2015. ^ "Jarre harmonica pistol". Forums.taleworlds.com. Retrieved 23 December 2017. This page was last edited on 6 April 2019, at 06:50 (UTC).